I like to laugh. Who doesn't? But everyone likes to laugh at different things, and I think seeing a person's sense of humor is a good indicator of if you will click with them or not. 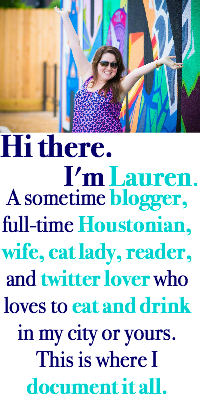 Here are some things that I find hi-larious lately. Are they funny, or is it just me? Anchorman Quotes. Seriously, Andrew and I quote this movie several times a week. Last night I remember saying "Mad? I'm not mad, I'm impressed." We also say "kind of a big deal," "diversity, an old old wooden ship," "San Dee-a-go,"it smells of rich mahogany and many leather bound books." There are many more but those pop up the most often. If you have seen this movie and thought it was ridiculous, I recommend watching it again. It gets funnier when your expectations are lowered. Plus, the sequel is coming out in December. I just want you to be prepared. Stupid Internet Words that I make fun of and then sneak into my vocabulary. Best example: Totes. Though, I learned that from I Love You, Man, and not the internet. I say "totes magotes" jokingly but I flipped out when I saw this in a West Elm email yesterday. Twelve Year Old Boy Comedy. If this commercial doesn't at least make you giggle then I believe you are made of stone. If you have already seen it, watch it again. It's still funny. New Girl. Zooey Deschanel isn't for everyone, but if you haven't laughed at Fat Schmidt then WHAT IS WRONG WITH YOU? Other things I find funny: my chunky cat trying to fit in a space too small for him. The Office, seasons 1-4. Suburgatory and Modern Family. The 40 Year Old Virgin. My husband's parody songs. Do we find any of the same things funny? What's making you laugh lately? 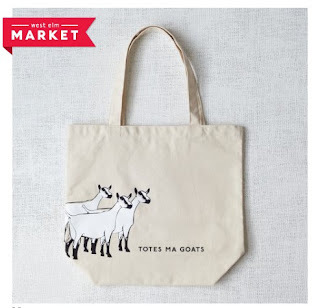 Goats ON A TOTE. I love it! SO nice finally meeting you in person yesterday! All of that is funny. All of it. Anchorman keeps coming on HBO. 60% of the time, I laugh every time. Just today I quoted Team America and Deuce Bigalow. AT WORK. "totes" kills me! Such an obnoxious thing to say... so of course I say it to my hubs all the time :) But never in public! Ha ha. I totally have a girl crush on Zooey... she is hilarious!